Shares of Evergreen Solar have continued to face downward pressure amid gloomy outlook for solar panel makers. Early this month, the company reported that its third quarter loss widened to $82.4 million or $0.40 per share, compared to a loss of $24.6 million or $0.19 per share, in the year-ago period. Revenues climbed to $77.7 million, compared to $22.1 million in last year period. Analysts, on average, expected the company to report a loss of 8 cents per share on revenue of $73.86 million. Though shipments increased 35% to to 31.3 megawatts from prior quarter's 23.2 megawatts, the company expects demand to moderate during the latter part of the fourth quarter and well into the first, reflecting industry seasonality. Evergreen managed to bring its wafer cost to $0.75 per watt in the third quarter compared to $0.85 per watt in the second quarter. The severe turmoil in the credit market took a heavy toll on panel makers as financial players abandoned U.S. solar energy projects last year. The 2008 collapse of top solar financier Lehman Brothers and the freeze-up in the global credit markets drove nearly all banks to halt funding for major new solar projects, forcing the makers of systems that turn sunlight into electricity to slash prices for their products and sending their stocks crashing. The financial crisis cut Evergreen's access to capital, forcing it to close its Marlboro plant and delay construction of its $800 million plant in Asia in 2008. Though there has been a marked improvement in credit environment, the company has not been really able to recover from the shocks. Globally, solar industry depends upon government subsidies and incentives. However, recent developments suggest that subsidies will inevitably be reduced or phased out. Evergreen Solar sells bulk of its panels in key European markets like Germany and Spain, where generous federal subsidies ensured high electricity rates for solar energy system. During the second quarter, approximately 61% of its product was sold in Europe, 24% in the United States, and 15% in Asia. In June, German legislators voted for steeper cuts to subsidized prices for electricity generated from solar panels. Last year the guaranteed price paid for solar-produced electricity was reduced by 5 percent. Some lawmakers had demanded a cut of as much as 30 percent in the subsidized rate. Spain too has taken similar steps. Evergreen Solar generates a bulk of its revenue from Europe. During the third quarter, approximately 73% of the company's product was sold in Europe, 24% in the United States, and 3% in Asia. Evergreen Solar uses String Ribbon technology to produce solar cells with 50% less silicon, than is needed by its competition. However, higher manufacturing costs have eliminated the company's lower silicon usage advantage. At the end of 2009, the company expects to manufacture cells for $1.50-$2.00 per watt, which is still behind competitor First Solar (NASDAQ: FSLR), with costs of 98 cents per watt. Moreover, US solar firms like Evergreen Solar are also facing stiff competition from their Chinese counterparts, who have been grabbing market share with lower labor costs, cheap land and abundant financing. Panel prices have fallen over 30% since mid 2008, making it very difficult for manufactures located in high-cost regions to remain price competitive. 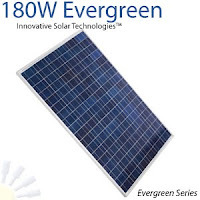 Evergreen Solar too has recognized the importance of China and is planning to move to China and outsource its module business in order to lower manufacturing costs. Early this month, Evergreen Solar said that its plans to stop producing panels at its factory in Devens, Massachusetts and shift that work to China next year. In April, Evergreen Solar signed an agreement with Jiawei Solar, and the Wuhan Donghu New Technology Zone Management Committee, i.e. the Chinese government, which will enable the company to expand aggressively in China. Evergreen cut its manufacturing cost by 17 percent to $2.24 per watt in the third quarter and plans the shift to China will drive down costs another 35 cents. In terms of stock performance, Evergreen shares are down 60% since the beginning of the year. Shares of the company plunged 13 cents or 8.39% to close at $1.41 on Friday.